Many people with gastrointestinal and numerous other health problems have low or absent levels of health promoting bacteria in the GI Tract such as Lactobacillus Acidophilus and Bifido Bacteria. In normal circumstances the good bacteria will proliferate in the gut and "colonize". Sometimes this is not the case. Some people have persistently low levels of these healthy bacteria and the good bacteria must be fed and encouraged to proliferate with what are known as prebiotics. Prebiotics provide food for the good bacteria and encourage them to multiply and do their beneficial work. Prebiotin contains a combination of prebiotics designed to support healthy gastrointestinal function, thus contributing to overall health. 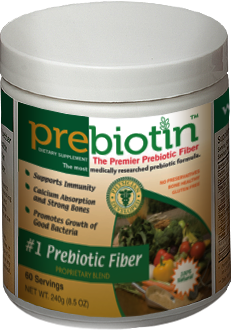 Prebiotin Prebiotic Fiber Supplement offers a full-spectrum prebiotic (Oligofructose-Enriched-Inulin, or OEI). Unlike ordinary prebiotics such as Inulin or FOS, OEI ensures that Prebiotin nourishes beneficial bacteria throughout the colon. OEI is also the most-researched prebiotic, used in many university and clinical studies. Prebiotin fiber prebiotic supplements are fat free, cholesterol free, sodium free, gluten free, vegetarian and low in carbohydrates. Plus, at less than 70 cents per serving, it?s far more affordable (and healthy) than a cup of morning coffee. DIRECTIONS: Use As a dietary supplement Mix with any food or liquid (room temperature or hot preferred). Has a pleasant, slightly sweet taste. Begin with 1/2 scoop per day for the first week. Increase gradually to 1 level scoop and repeat 2 or more times daily as tolerated. - Or as directed by your healthcare professional.